Food Blogger Annem Hobson asked the original question of the cheese advent calendar back in 2015, and after much googling discovered that they didn’t exist! She set out on a mission to create one, starting with a DIY design of her own. In 2016 Annem launched an online campaign to gather interest and soon had a community of over 11,000 dedicated cheese lovers (in just four days! ), keen to see it become a reality. After trending on Facebook for two days, the calendar went viral and garnered celebrity shout outs from the likes of Phillip Schofield, Emma Bunton, Zooey Deschanel and Taio Cruz! It launched with the help of Norseland in Ilchester, Somerset after a succesful pitch; (the innovative cheese specialists behind leading cheese brands, Jarlsberg®, Applewood®, Mexicana® and Ilchester®) and came to the market in 2017. Jarlsberg®– Famous around the world for its distinctive sweet and nutty taste. Smooth, distinctive and rounded, it has a hint of sweetness and a unique flavour. Applewood®– A real English treasure. Applewood is made in the West Country from British cheddarand has a delicate smoky flavour and a lovely smooth texture, all finished with a dusting of paprika for good measure. Ilchester®Mature Cheddar– Ilchester’s Cheddar comes from the West Country near where Cheddar originated in the Mendip Hills. Take a bite and let the creaminess melt into your mouth, with earthy tangy notes. Ilchester®Red Leicester Cheese– Smoothand Nutty! Add a splash of colour to your cheese board with this traditional English cheese based on a classic Cheddar recipe. Ilchester®Wensleydale with cranberries–Traditionally made with a smooth and creamy gold award winning Wensleydale. It is creamy and smooth andperfectly paired with juicy sweet festive cranberries. Ilchester®Edam – Dutch Edam selected by Ilchester®for its smooth and creamy flavour. Limited Edition Ilchester®Wensleydale with Gingerbread– Adding more magic to Christmas eve, Wensleydale and Gingerbread has the delicious sweet flavour of Gingerbread biscuits. All cheeses are suitable for vegetarians. The advent calendar must be kept refrigerated. Does it have to be kept in the fridge? Yes. 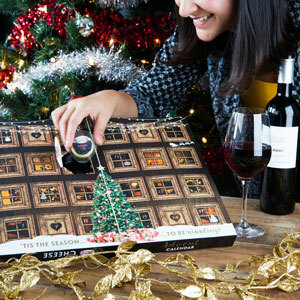 A lot of love and attention to detail went into creating the box and whilst the calendar must be refrigerated, it has a unique ‘book style’ packaging design, allowing one half to be torn off after the initial 12 days of Christmas to maximise fridge space. Is it waterproof, will the box get damaged from a damp fridge? Yes, it’s waterproof! Is the box recyclable? Yes, the box can be recycled. How many cheeses are there? There are 24 cheeses, in 7 different varieties! What size are the cheeses? 20g of cheese each day! Is it gluten free? Yes, the cheese is gluten free! I’m pregnant, is it pasteurised cheese and can I eat it? Yes, the cheese is pasteurised but we encourage you to seek dietary advice from your doctor if you have any concerns. Are the cheeses sugar free? 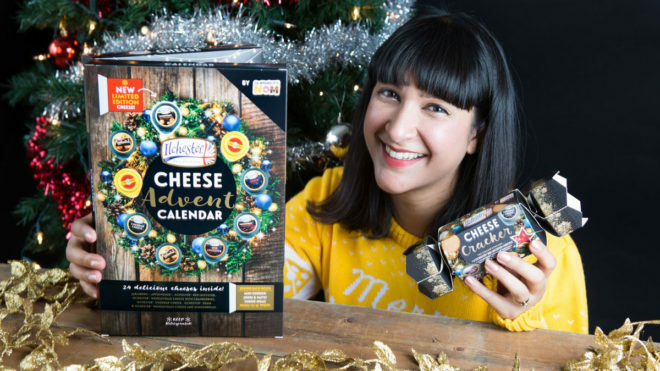 Whilst a Cheese Advent Calendar has considerably less sugar than a traditional chocolate one, it does feature some Wensleydale and Cranberry which contains sugar. Find Annem’s original blog, complete with DIY instructions to make your own on her blog So Wrong It’s Nom here. 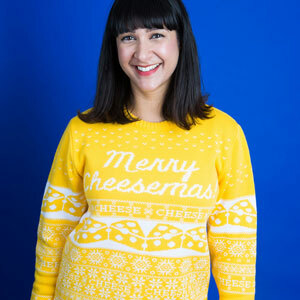 Fancy a Merry Cheesemas jumper? Yet another innovation from Annem, you can purchase yours online here. Curious about the latest prototype cheese cracker? Pledge your support to help her turn this idea into a reality. 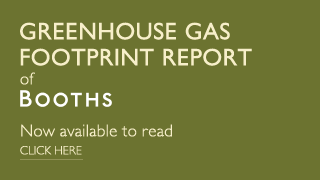 Find out more on Annem’s blog here. Tap the button below to find your nearest store – we recommend contacting the store before travel to avoid disappointment.